More miles on the car, more classes taught, more botanic gardens visited, and more, more, more.... This past week found Ken and me driving to Missouri and enduring very hot and humid weather to visit the Powell Gardens in Kingsville, MO for Moonvines and Martinis evening tours of the gardens, a relaxing indoor picnic/barbecue at the home of my cousin Shelley Ranking and her husband Mike, a walk around the Marina at Blue Lake, and visiting the Missouri Town village, a representational historic town featuring relocated and rebuilt log cabins, antebellum houses, tavern, blacksmith shop, school, farm buildings etc. from ca. 1855. We found out how soft we have become when we had to seek air conditioning after less than an hour outside in the heat. Dripping wet with sweat is not my idea of a fun time, believe me. Next is the Kansas Quilter's Organization "Golden Oldies" retreat in Salina, Kansas this coming weekend. This one is just for fun! I'm going to spend time with old friends, do a little relaxed stitching on a couple of projects, one hand, and one by machine, let someone else do the cooking, and rejuvenate my creative spirit. We all need this from time to time, but this will be my first time at the particular retreat. The group is made up of former and current KQO board members. I qualify by virtue of being one of the retired (maybe simply tired) newsletter editors. The whole organization meets twice a year with nationally known teachers and speakers providing the classes and programs, but this weekend's particular retreat has no planned activities— just come, sit, and sew among friends. Still haven't gotten to the next Freezer Paper lesson I've been promising you, but I have been doing a lot of thinking about the direction I want to go with my website and this blog. In the planning stages are an idea for offering a free pattern for a Block of the Month quilt. I already have several month's blocks finished, and all the patterns drawn. Miss Kitty's Quilters (my local club) is making them for our next opportunity quilt (AKA raffle quilt in other states) so you could be making your blocks along with us. These are original applique blocks, and might go right along with the freezer paper applique technique I'm intending to give you. What do you think? Would a free pattern like this keep you coming back? Each of the 12 month block patterns have the same heart shape in the background, but with themed flowers and other things related to the appropriate seasons. Photos will be coming. Something else I've been thinking about is about setting goals for my quilting business. I've always made TO DO lists each morning because I like the feeling of checking things off and seeing what all I've accomplished that day. Writing things down frees up my mind to concentrate fully on what I am doing during the day. I know that the list will be there to help keep me from getting off track. But sometimes I find that my TO DO's are more like things to just keep me busy and aren't really important steps toward growing my business, or improving my quality of life. (The Freezer paper lessons are quickly rising to the top of my lists, believe it or not.) 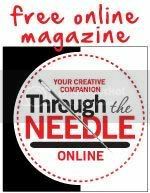 Recently, Morna McEver Golletz of the Professional Quilter magazine, posted a list of ideas that she called "Five Tips for Creating Powerful Intentions" online. Her slant on things gave me food for thought, but what I found most interesting was how closely her 5 tips paralleled what I have found to be most effective for setting goals: 1. Clarify what it is you want to achieve. Goals should be stated in simple, easy-to-understand language, and each goal should be separated from others. 2. Write your goals down. Putting things into words makes it easier to refer back to them when you find yourself sliding off-track. Post the list where you will see it daily or can refer to it more often, even several times a day. The place to post your goals would ideally be related to that goal. For instance, the refrigerator might be the most appropriate place to post a weight-loss goal. 3. Share your goals with someone who cares about you and wants you to succeed. This person or group of persons should be non-judgemental, and supportive, and encouraging. 4. Break your goals down into single, simple, and easy to accomplish steps. Set a time line by which to finish each objective, and check your list often. These steps should be easy to measure, and you should be able to easily tell when you've reached the objectives you've set for yourself. 5. Celebrate your progress along the way. Treat yourself to an appropriate reward. If your goal is to lose weight, and you've lost that first 10 pounds, for example, maybe you would choose to treat yourself to a new outfit. (Taking yourself out for ice cream would probably be a self-defeating award for this particular goal.) When I won my first BIG cash award in a national quilt contest, I treated myself to a new sewing machine, one I'd wanted for a very long time. A reward for accomplishing a daily objective might be as simple as taking a long bubble bath and 20 quiet minutes to read a chapter of a novel that has been sitting on the bedside table for months, or maybe just a telephone conversation with your 'coach' from step #2 above. I'd love to see a discussion here about your goals, personal and/or professional, and how you go about achieving them. Do you find it useful to write them down? Who is your 'encourager' and what role do they play in helping you get where you want to go? Are you working on an important goal in your life right now? Why? Hi Elsie :) I'd love to see your BOM!!! I adore applique :) As far as goals, in my world, I find myself waking up every morning with the intention of just trying to do the best I can ... it is a daily challenge. Hi Elsie, I have a lot of things that I wish that I were doing but am so unfocused that I can't seem to choose which one to focus on at the moment and therefor feel like a rattle brain. I've heard of personal vision boards and had promised myself that I would do one for me but never got around to doing it. Maybe now is a good time. Also, you mentioned your local quilt group, Miss Kitty Quilters. Do you have any tips for finding a local group and if you can't find on, then how to get one started? To find a local quilting group, probably the best place to start is at your local quilt shop. You can use the yellow pages or Google to find your nearest quilt shop. 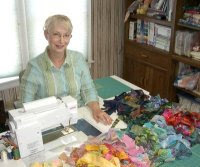 If there isn't an organized group near you, maybe you could enroll in a class or two that is offered at the quilt shop. Classes are a great way to make friends and sometimes a new quilting group can be formed from this core group. Hope this helps....keep us posted!